Trivia Christmas is coming a bit early this year. Instead of the usual 18 month wait between events, we’re getting another installment of the Jeopardy Tournament of Champions a mere twelve months since the last incarnation. 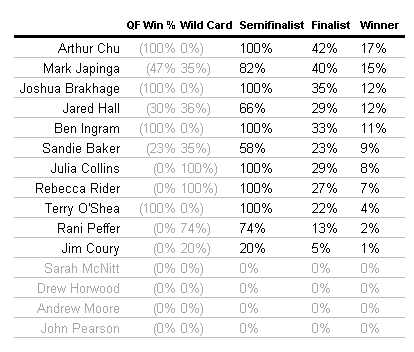 It’s always fun to try to predict how these things will go, so we’ll see if we can better our efforts from last year, where we had eventual winner Ben Ingram rated as the fifth most likely winner in a fairly wide-open field. This year, however, the field has broken down into three distinct groups. The field is led by two co-favorites, each of whom have a one-in-five chance of victory. There are three dark horse candidates for the title, with chances of victory ranging from 11% to 14%. Finally, we have the remaining ten contestants, none of whom have more than a 1-in-25 chance of taking home the title. Before we reveal our predictions, let’s do a quick recap of our methodology. We analyse players’ ability using two metrics. 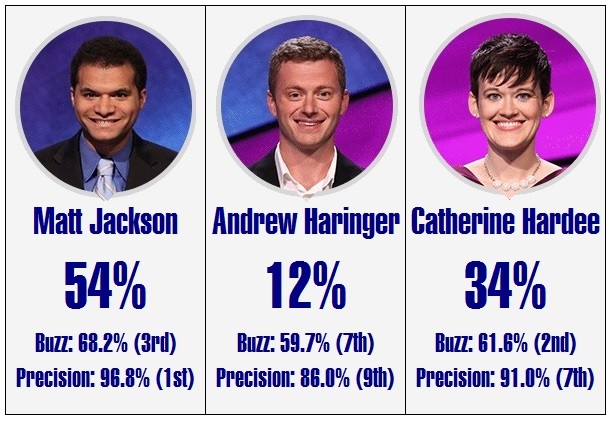 The first is Buzzer Percentage, which attempts to measure how often a contestant will buzz in. 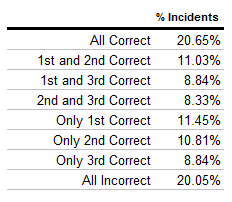 Since we can’t measure this directly, we use a Monte Carlo simulation to estimate it based on how often a player has successfully rung in during their previous games. 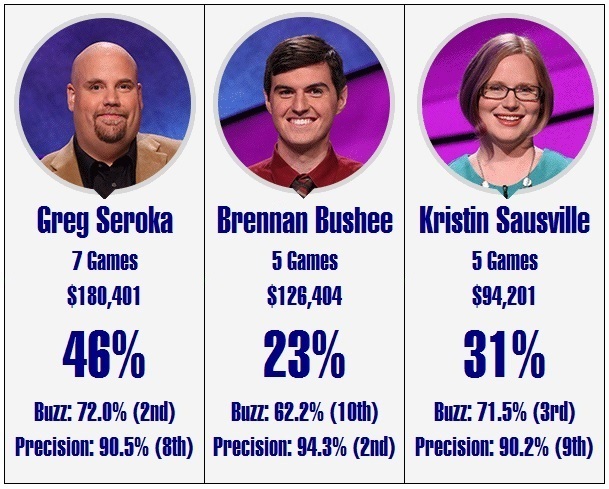 The second metric is Precision, which is the percentage of times that they are correct on clues where they buzzed in (ignoring Final Jeopardy & Daily Doubles). 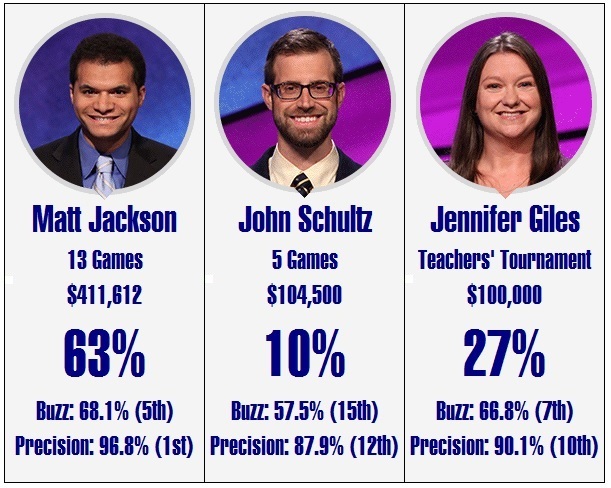 For reference’s sake, the average Jeopardy contestant has a buzzer percentage around 60% and a precision around 87%. This system is based on the system that the designers of Watson used to simulate human opponents for Watson to practice against. If you want a dark horse candidate for your those office Jeopardy pools I know you’re all in, Catherine Hardee is a decent candidate. Despite winning one game fewer than Dan Feitel and Vaughn Winchell, her strong Buzzer Percentage and respectable precision gives her a slight edge in Monday’s matchup. Two of the three dark horse candidates face off on Tuesday’s show. 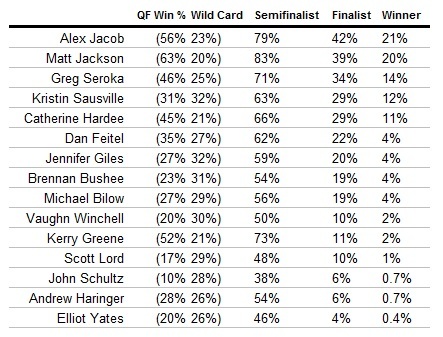 Greg Seroka and Kristin Sausville both have a decent chance of taking down the whole tournament. Brennan Bushee is a bit unfortunate in his draw; despite his strong precision he could get squeezed out by two of the tournament’s strongest buzzers. 96.8% precision. Ninety-six point eight percent precision. That is a crazy, insane, whacked-out number, and helps make Matt Jackson, unsurprisingly, one of the favorites for the tournament. Jackson draws a fairly easy group for his first game. 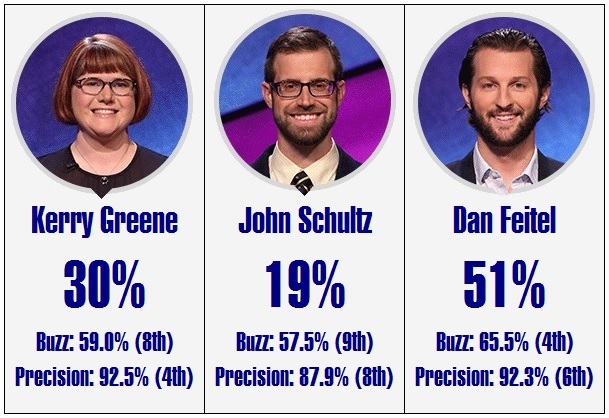 John Schultz’s metrics are among the weakest in the field, and are actually comparable to an average contestant. 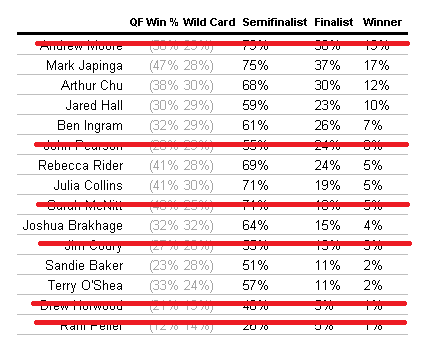 Jennifer Giles could take an upset win, and in doing so become only the second Teacher’s Tournament winner to make the second week. The first, of course, being Colby Burnett, who won the whole thing in 2013. There’s no nice way to put this: the lineup for Thursday’s match is by far the weakest. 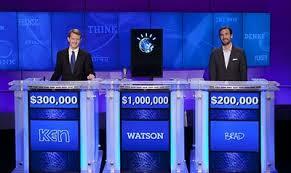 All three contestants are very conservative buzzers; expect a higher than average number of clues going untried. Kerry Greene is at least precise when she buzzes in, which gives her quite an edge over the error-prone Andrew Haringer and Elliot Yates. Any way you slice it, this game will give an automatic semifinal berth to a player who may have had a hard time qualifying in other games. Alex Jacob has the busiest buzzer finger in the entire tournament. When paired with his excellent precision, it makes him the co-favorite to win the entire tournament. Scott Lord and Michael Bilow will have a hard time matching up. 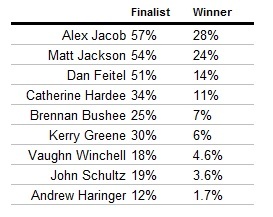 Alex Jacob and Matt Jackson are so close that it’s fair to call them co-favorites to win the tournament. Assuming that they manage to avoid each other in the semifinals (which is what caused most of their eliminations in our simulations), they should get to lock horns in a great two-day final. Chances are they’ll meet one of Greg Seroka, Kristin Sausville, or Catherine Hardee there. 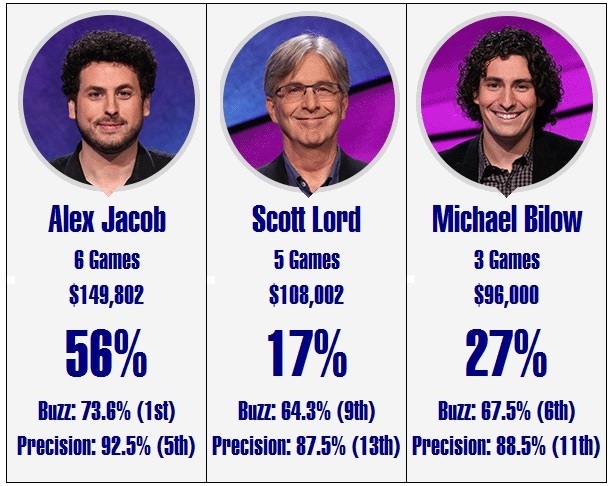 At that point, the only winners I’d be willing to predict for certain would be the audience, who would get to watch an exhibition in excellent Jeopardy gameplay. You gotta hand it to Arthur Chu. Despite being handed the toughest draw in the field, he’s making this look easy. 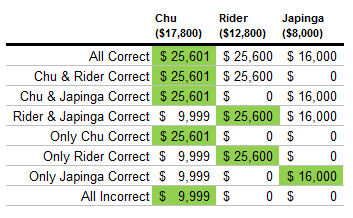 Mark Japinga’s negging and Rider being crowded out on the buzzer could have made this a runaway, but Rider doubled up on a good Daily Double, and Japinga made a late run to remain relevant. – $300-400 if you are not confident. Enough to take over the lead, but still enough to stay in touching distance if you miss it. – $2,000 if you’re confidence is average. Beyond a certain point when you’re leading, every dollar you have is gives you a smaller chance of winning than the previous dollar. At this point, the diminishing returns of increasing your score catch up with the chances that you’ll actually get the clue right. – $2,400 if you’re supremely confident. The system suggests the diminishing returns beyond that point are not worth an all-in wager, but I certainly wouldn’t begrudge one if that was your choice. Chu’s selection of $1,000 is an odd one. It’s not conservative enough if you don’t like the category (which I imagine was Chu’s reasoning), as it leaves you at least two clues behind to catch up if you’re wrong. It’s also not aggressive enough to take advantage of the opportunity that a Daily Doubles represents. Chu hit the first Daily Double in Double Jeopardy, and again wagered $1,000. The situation was much different this time, with Chu on a commanding $13,200 over Japinga’s $3,600 and Rider’s $1,800. Without looking too deep at the details this time, I think the two choices in wagers would be the minimum of $5 if you want to protect your lead, and a more aggressive wager of $6,000, looking to close out the game here but still keep twice Japinga’s score if you’re wrong. I don’t begrudge Chu his wager that much, since I doubt there was any great difference between wagers of $5 and $1,000. And despite the disclaimer that this could be the stupidest thing she ever did, Rider’s true Daily Double later with her score of $4,600 a long way back of Chu’s $16,600 was the only real move she could have made, especially in a category that she seemed to like. 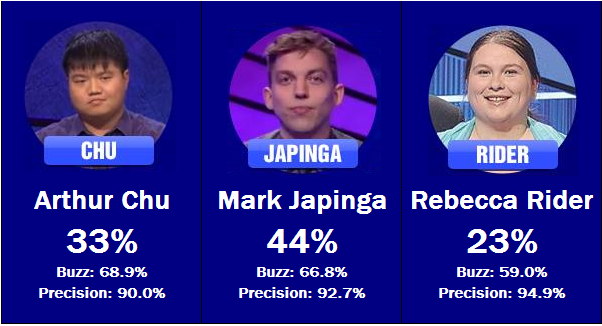 She answered correctly, and Japinga made a late run to set up a Final Jeopardy where all three players could still take the victory. 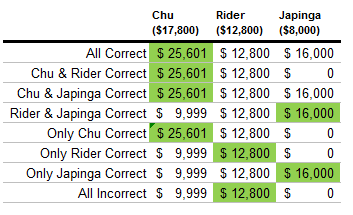 The scores were Chu with $17,800, Rider with $12,800, and Japinga with $8,000. I’ll leave the exact analysis of the situation to Keith at The Final Wager, who does a better job at it than I could ever hope to. But I do want to talk about something that I feel very strongly about which comes into play here: Stratton’s Dilemma. Coined by Andy Saunders, Stratton’s Dilemma is the term for the situation Rider finds herself in, where she has to choose between two possible wagers. Let’s analyze her situation. 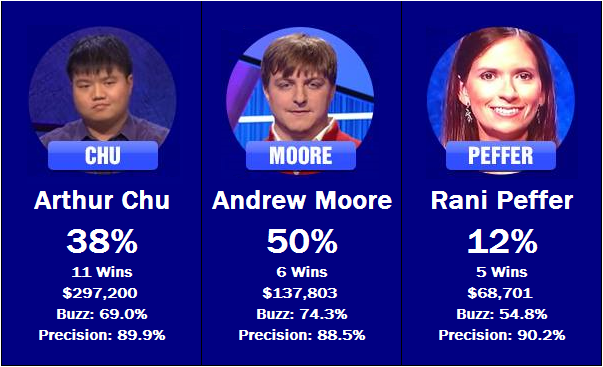 We can assume that Chu will wager $7,801 or thereabouts, the amount needed to guarantee his victory as long as he gets Final Jeopardy correct. We must assume that Chu responds incorrectly, otherwise we have no chance of winning. If Chu is incorrect, he will be left with $9,999. 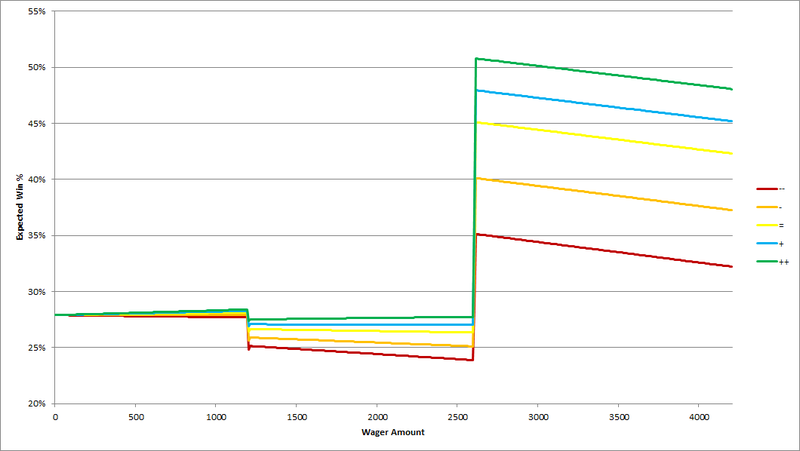 Thus, it is in our best interest to wager no more than $2,800, staying ahead of Chu no matter what our outcome is. However, the presence of Japinga complicates matters. If Japinga wagers everything and doubles up, he’ll have $16,000. To ensure that we remain ahead of Japinga in that situation, we have to bet at least $3,201. Sometimes we can find a wager to satisfy both scenarios, but this is not one of those times. We have to choose one or the other, and know that some of the time we will choose incorrectly and lose when we could have won. It’s an infuriating position. Which bet should we choose? I took a look at 2,184 games played over the last 10 years where all three players made it to Final Jeopardy. Specifically, I counted the times when each of the above scenarios happened. 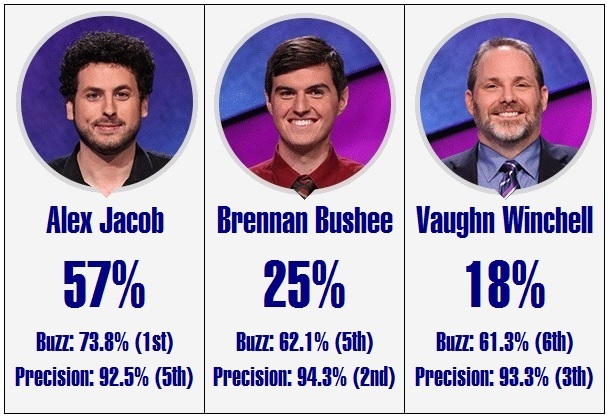 I separated the players by their ranking going into Final Jeopardy, so I know how often the leader missed Final Jeopardy while the other two got it right, or only the second-ranked player responded correctly, for example. And what were the results? Unsurprisingly, the scenarios when all three players responded correctly and all three players responded incorrectly are more likely than any other case. Players possess a shared knowledge base, and a question that one person knows is likely to also be known by the others, and vice versa. The situation we’re hopping happens when we bet big, where 2nd and 3rd place answers correctly but the leader does not, is the least likely to happen. If we quantify our chances of winning using the above table, we have a 30.9% chance of victory with a small bet, while we only have a 19.1% chance of success if we wager big. I don’t know about you, but if one choice of a dilemma increases my chances by over 60%, I wouldn’t call it much of a dilemma. Well, we’re going to get the matchup we wanted, Collins vs. Chu. And frankly, this tournament is now Chu’s to lose. 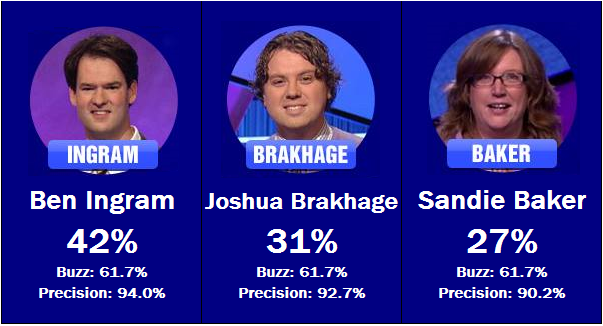 Regardless of who wins the next match between Ben Ingram, Joshua Brakhage, and Sandie Baker, I can’t help but see Chu as a strong favorite, especially over a two-day affair where the normally high level of variance inherent in a Jeopardy match is lowered. The “curse” of second place continues. This makes it the sixth straight time that the player with the second ranked chance by my system won the game. Terry O’Shea may have been extra choosy in her clue selection, but her 100% precision and her tendency to score rebounds off of the others still gave her a strong showing. Jared Hall and Julia Collins played very similar games, but Hall found all three Daily Doubles. Had he converted his all-in wager early in Double Jeopardy, the result may have been a lot different. Instead, Julia played up to the expectations placed upon her, and became our first Finalist. Hall, as lampshaded by Trebek at one point, was the only player playing tonight who picked clues from the middle of the board at first, hunting for the Daily Double. He was rewarded handsomely for his efforts, as all three Daily Doubles landed in his lap. 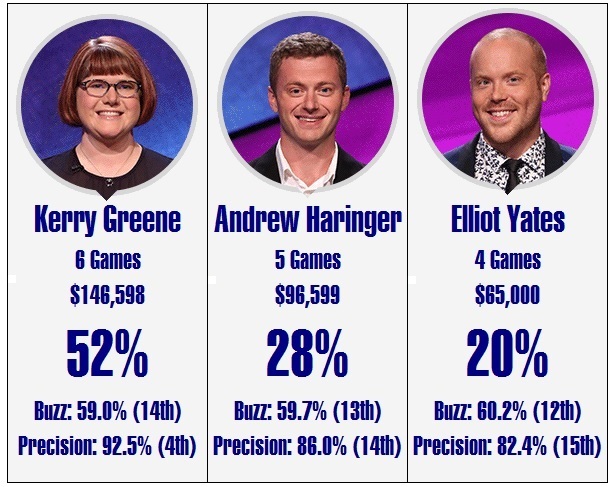 The first and third were rather straightforward efforts, with Hall having less than $1,000 in the Jeopardy round and $2,000 in Double Jeopardy, which almost always necessitates the maximum wager allowable wager of $1,000 or $2,000, depending on the round. His second Daily Double, however, I think deserves some extra attention. 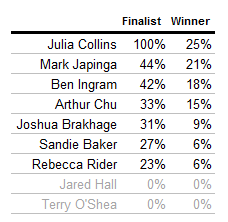 Hall had $4,200 early in the Double Jeopardy round, poised between Collins’ $6,800 and O’Shea’s $3,000. The Daily Double was hiding in the $1,600 clue in the category Great American Novels. The average player would probably pick a middling value without too much thought, probably about half their score or less. 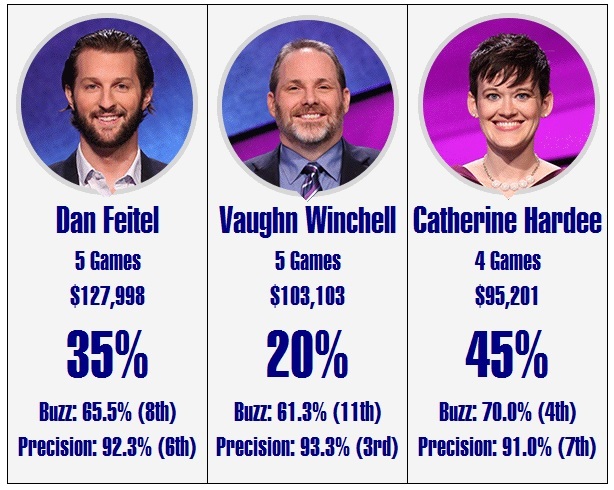 Hall did what I imagine most good Jeopardy players would do, and bet it all. There’s still enough money left on the board ($27,600 out of the $36,000 that started the round, as well as the other Daily Double) that even if you go bust, there’s still enough time to make a comeback. And if you respond correctly and double up, you’ll have a lead and be well poised for the rest of the game. – $0 – $1,200: Pretty bad. You’re still going to be in second place no matter what. – $1,200 – $2,600: Even worse. Best case scenario is that you’re still trailing the leader, but now if you’re wrong you’re dumped down into 3rd place. – $2,600+: Best. The benefit of being in first place if you are correct greatly outweighs the chance that you’ll be in third. What’s interesting about this section is that your chances decrease as your wager increases beyond what it would take to get into first, indicating that perhaps what you gain by increasing your score above $6,801 is not worth what you lose if you by going further and further behind. Like I said before, I don’t consider this system to be ready for prime-time, but it gives us something to think about: that a knee-jerk all-in bet in this scenario may be good, but not optimal. Going into Final Jeopardy, it was still anybody’s game. Collins led with $12,000, O’Shea had $8,200, and Hall was right behind them with $7,600. This situation may look a little boring at first, but digging a little deeper into the math reveals a truly fascinating situation – and one that’s very scary for Collins, despite being in the lead. 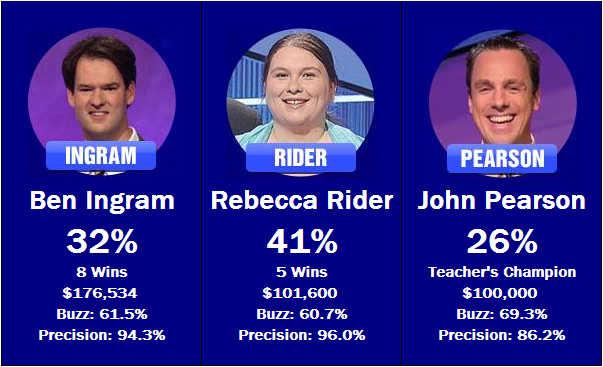 Keith Williams of premier Jeopardy wagering blog The Final Wager has an excellent write-up and video detailing why, one that I highly recommend watching. 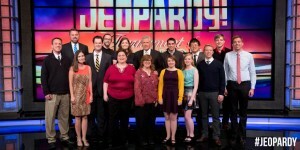 The producers of Jeopardy stop tape to give the players as much time as they want to calculate their wagers; Collins took 15 minutes to finally settle on hers. 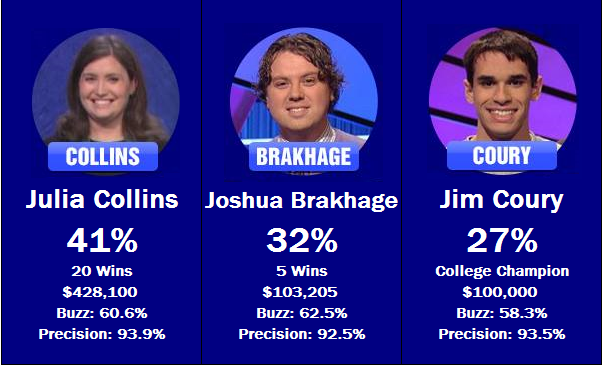 In a cruel twist of fate, all of the strategizing proved moot, as only Collins was able to get the correct response in Final Jeopardy, and is our first confirmed finalist. Well done to her. She rode her luck a little, earning a wild card with a historically below-average score, and not getting any of the Daily Doubles in this match, but I don’t think anybody could begrudge her her place in the finals. Collins moves up to the top by virtue of having secured her finals place. The remaining players’ chances only moved a fraction of a percentage point – Collins’s stats were darn near close to the average expected stats of the player coming out of the first semifinal. 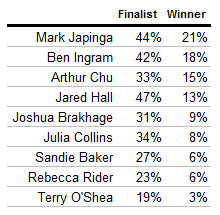 We’ll see if tomorrow will get us the final match that everybody wants to see: Arthur Chu vs. Julia Collins, or if Mark Japinga or Rebecca Rider will upset the storyline. Sorry that I never got an update out on Friday’s match. Jeopardy was preempted here, so I didn’t get to watch the match until late Saturday. Quite a good match, mind, as all three players played well and wagered well, and all three were rewarded with advancement. The only player who played close to expectations was Mark Japinga. 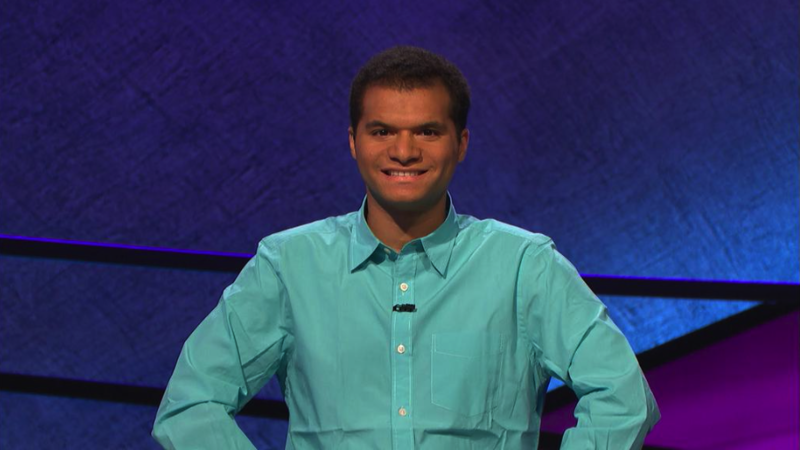 Jared Hall played conservatively, but never made a misstep (outside of 1 Daily Double), and took the win after Japinga wagered for a Wild Card spot in Final Jeopardy. 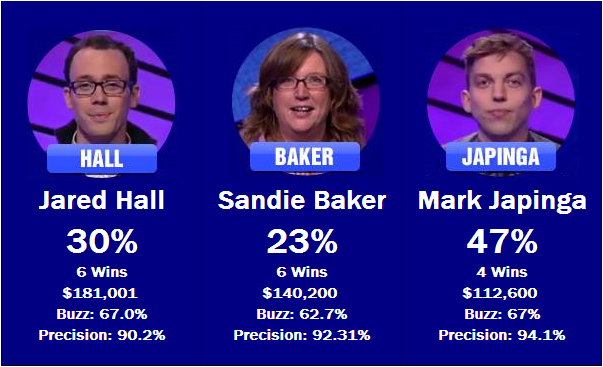 Sandie Baker didn’t have the best game either, but still had enough money to bet big in Final and take the last Wild Card spot. So, we have our nine players. Stepping back to evaluate the performance of my system so far, I’d have to give the system’s predictive power a rating of B- so far. 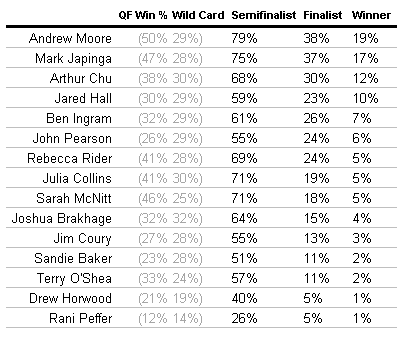 It whiffed on Andrew Moore being the favorite, but on the other hand of the five players least likely to advance, four of them indeed failed to advance. On an individual game basis, the middle ranked player won all five games, although to the system’s credit in two of those games the favorite was leading heading into Final. Looking forward, the picture is much more clear. We know what the three semifinal matchups are going to be (thanks again to The Final Wager for releasing them on Friday), and the picture of what our three finalists are going to be is getting clearer. As a result, there have been some massive shakeups in our odds. Let’s look at each matchup in detail. After looking at the draw, I’m pretty sure that the semifinal matches are seeded based on each player’s quarterfinal score. The top three winners go into one group, the other two winners and the best wild card go into the second group, and the remaining wild cards go into the final group. Each game is made up of one player in each group. Terry O’Shea’s Thursday score was the third best score among the winners, and I bet Jared Hall and Julia Collins are thankful for that fact. In another universe, they could be playing against one of the other top seeds: Arthur Chu or Ben Ingram. Instead, Hall and Collins will likely battle it out among themselves for the finalist spot. Hall’s stronger buzzing percentage gives him the edge over Collins’ better precision. 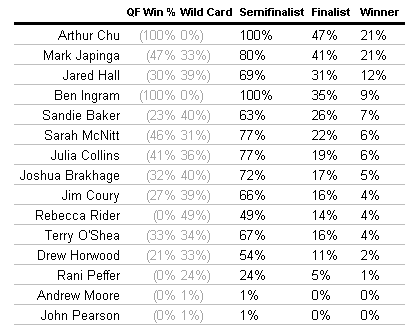 If Arthur Chu ends up winning the tournament, nobody could ever accuse him of getting an easy draw. After taking down Andrew Moore in his quarterfinal match, he now faces off against Mark Japinga, our system’s current favorite. Rebecca Rider rounds out this trio – she’ll have to be at the top of her game to get past Chu and Japinga. Wow. Just … wow. 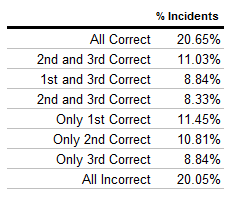 After factoring in each player’s performance in the quarters, we have a situation where each player’s buzzing percentage is practically the same. Ben Ingram has the edge in the system thanks to his superior precision, but really this one could be anybody’s game. 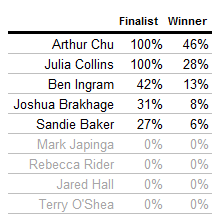 It would not surprise me to see Joshua Brakhage or Sandie Baker advance. Expect this game to be close going into Final Jeopardy. Mark Japinga now takes up the mantle of favorite. If Arthur Chu beats him on Tuesday like he did to our previous favorite, I would be very surprised if he didn’t go on to win the tournament. Ben Ingram moves up to #2 despite Wednesday’s game being little more than a crapshoot. Monday’s winner will probably end up being the underdog going into the final games; the system only sees one of those three winning one time in four. No matter who advances, expect some excellent knowledge and strategic game playing on display. Check back all this week for updates. When I suggested in my preview that you could “expect [a] game where a number of clues pass by unanswered”, I didn’t quite mean it to this extent. Whether it was the material, the players, or the lunch break that would have preceded this taping, the game just never got off the ground. All three players underperformed on their buzzing, and only Terry O’Shea hit her previous level of precision. Thirteen out of the 57 non-Daily Double clues passed by our competitors without a single buzz, not to mention several more that only elicited incorrect responses. It was a bad day at the office for all parties involved, and unfortunately it cost two of the players their shot at the title. Normally I’d break down the strategic choices made by the players in this space, but there’s not much to say. 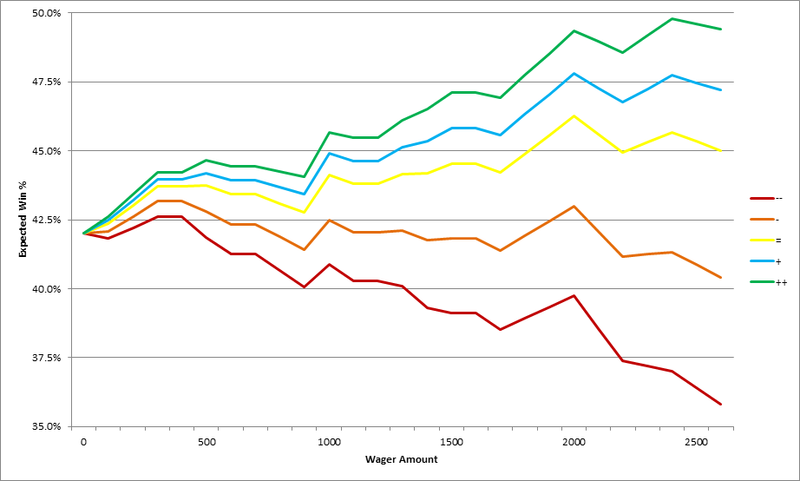 All three Daily Doubles were found by the player in distant last place, all three times the player correctly wagered big, all three times the wager was lost. 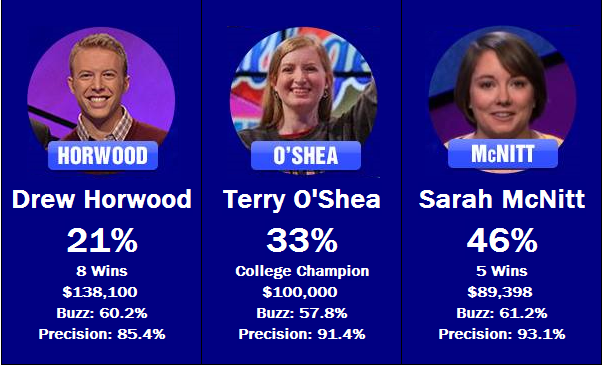 Drew Horwood finished the match in the red, and didn’t play Final Jeopardy, while O’Shea had a slim lead of $8,800 to Sarah McNitt’s $8,600. Both bet big, since you’d think their scores wouldn’t be worth a wild card, although this tournament is shaping up to have a low cutoff (again, they wouldn’t know that at the time). O’Shea bet to lock-out McNitt, and was correct, earning the automatic advancement. McNitt bet as big as she could, but still kept enough back to win on a Triple (Double?) Stumper, but missed Final Jeopardy. Her final total of $500 is already known to be not enough to advance. On a more positive note, with Horwood and McNitt dropping out, we can now welcome Rebecca Rider and Julia Collins into the semifinal fold. Rani Peffer’s $7,599 is looking pretty good at this point. and Jim Coury’s $5,600 still has a shot of holding up. We’ll see what happens after the dust settles on tomorrow’s last quarterfinal. Jeopardy tournaments are a harsh mistress. One bad game, and you’re out on your backside. Arthur Chu’s performance was nothing less than I expected from him coming into the game. It was Andrew Moore’s underachievement (and to a lesser extent Rani Peffer as well) that turned the game into a blowout for Chu. My gut instinct on Daily Doubles in the Jeopardy! round is to always bet aggressively. When Moore found the Daily Double after he and Chu went on a wild goose chase for it, most of the high-dollar clues were off the board and the two of them were tied at $2,600, with Peffer trailing at $600. Moore opted to bet only $1,000, and after analyzing the situation, I’m inclined to agree with him. Given that the DD was hidden in the $1,000 space (indicating a harder clue), and that most of the money had been stripped from the board, a modicum of restraint was to be called for. However, the situation was different when Moore found the first DD in the Double Jeopardy round early on. He had a slight lead at the moment, $5,600 to Chu’s $5,200 and Peffer’s $2,200. It’s a close decision, but this would have been the time to make a move. A wager of all or almost all of his money would have given him the opportunity to take a stranglehold on the game with only one DD left on the board. He instead chose to wager $2,000, and perhaps this was the right move, since he missed the clue. After that stumble, Chu went on a hell of a run, and by the time he found the 2nd Daily Double late in the round, he had an unassailable lead. Not much to say here. Chu had a lock on the game, and could sit this one out. Moore and Peffer knew their current scores wouldn’t hack it, so each bet everything but $1. Moore missed, and has gone from our favorite to all but out in the blink of an eye. Peffer nearly doubled up, and takes the #2 spot on the wild card list for the nonce with $7,599. With our favorite knocked out of contention, there’s no surprises who took over at the top of the list. A bit of change elsewhere on the list. With Moore no longer a potential hurdle, many people saw their chances of getting to the finals and winning increase. Two wild card scores coming in under expectations increases the chances of the people yet to play of taking a wild card. Rebecca Rider’s score in the clubhouse of $11,600 is looking better; she’s even money to advance now. Arthur Chu has dropped the gauntlet. Will Julia Collins pick it up tomorrow and keep the chances of everybody’s dream matchup alive? Check back tomorrow for the analysis.